How Much Food Do Goats Need Per Day? You should read this comprehensive guide if you want to find what the best goat feeder for your goat is, especially if you are short on time or you’re tired of reading all the goat feeder reviews out there. Our team took the time to carefully examine the quality and characteristics of the most sought-after models, and the conclusion is that the Gaun Sheep & Goat Feeder is the one that will suit most situations. It is a versatile feeder, as it allows you to place both grain and hay in it, diversifying your goats’ diet without the need of an additional feeder. Its design is one that is very good at keeping the food inside. Finally, it’s made in such a way that no food gets spilled on the ground and that reduces the risk of your goats ingesting bacteria. If you can’t find it, be sure to check the DPD Sheep and Goat Basket, which is next on our list. Being designed to hold both hay and grain at the same time, this is an efficient feeder as it saves you from buying two separate models. You can place it anywhere due to how it’s made and although it can stay on its own, it’s best if you hang it on a panel or fence. The metal base prevents food from being wasted. The small size means this feeder is good for one goat only, or maybe 2 of them at max. It’s a good choice if you want to give your goats grain and hay at the same time. It prevents goats from trampling their food and thus ensures that they will eat more of it. Filling this feeder is an easy task, and if you attach it to the fence of the goats’ stall, you can simply put hay in them over the fence. Goats tend to eat off the ground, but using this basket forces them to eat above the ground and thus reduce the risk of illness. Although the installing process is easy, the basket doesn’t come with its own screws. A simple yet efficient feeder, this one is very safe for your goats. Weighing only 2.4 pounds, this trough is extremely light and it can be placed anywhere. That is why you can also take it with you at shows or selling events. Being a trough model it can hold any type of food, from grain to hay or chaffhaye. For its size, it fits plenty of food, which is great if you don't have too much space. It comes with no drainage holes and the food will get wet, especially if left outside. Small, yet capable of holding lots of food, this trough can be placed anywhere. The number of feeders out there is huge, and taking into account all the different models, it’s hard to pick the perfect one. But we did the research for you, and after checking opinions, reading what makes a good feeder and what not, we made the following list of what we consider to be feeders that are always a good choice. This sheep and goat feeder is very useful for holding grain and hay, being a metal box made in Spain which is 21″ in height. The fact that it is metal-made guarantees longer durability and resistance to shocks. The item is ideal for small animals such as goats and sheep because it is small enough so their heads won’t get stuck and also large enough for the goats to easily access the hay. Its structure is also economical because it doesn’t allow the food to fall on the ground and be wasted. If any hay falls through the hangers, the animals will be able to eat it from the base of the feeder. It can be placed on a board, panel or gate, having 2 metal hooks on the back. The height of the feeder is adjustable and it has a medium capacity, recommended for 1-2 goats, which makes it easy to move it from one location to another. The sheep & goat feeder by Gaun is designed to hold both grain and hay so you don’t need to buy different sheep and goat feeders for each type of food. The feeder’s structure prevents food from being wasted by not letting the hay fall on the ground. Due to its metal base, it is healthier for the animals because the risk of ingesting parasites off the ground is lower. This is a freestanding feeder but it can also be hanged on a panel/fence/board and one of the main advantages is that it can be moved anywhere without big efforts. There might be a problem with the two metal hooks on the back which are suitable for plenty of surfaces but the spacing isn’t perfect for all types of fences. This item isn’t very large and it isn’t suitable for more than 2 goats so if you are a goat herder it might not be what you’re looking for. Thanks to this basket feeder the consumption of hay is more simple. The goat hay feeder’s dimensions are 11 x 11 x 11 inches, and it’s specially designed for sheep and goats, storing a really good amount of hay. The size of the feeder is suitable for small pens or birthing goat stalls, being enough for 1-2 goats. If you’re looking for an inexpensive way to save a significant quantity of hay weekly, this item fits your needs. It weighs 6.55 pounds and it has a strong and solid structure made from steel with a reinforced wire design that can take years of abuse. The basket presents the added features of being portable and very easy to clean. There are no difficulties with installing it, being easy to hang on fences at a convenient level for your goats. It is good for any situation but especially for the seasons when grazing is less accessible. Goats will not eat their food once it has been trampled so the basket feeder helps in this way, having an opening that is large enough for the goats to eat comfortably. For extended support and protection, the back panel of this feeder can be securely attached to the fence and it is simple to drop hay in over the fence. When feeding in a confined area using the basket feeder, you’re lowering the risk of animals getting ill. Using a basket feeder helps in preventing paddock degradation. As mentioned, the installing process is very easy but one minor problem is that it does not come with its own mounting screws. This type of feeder is suitable for normal hay, but it will not prevent the fine hay being wasted and it might be necessary to add a drip pan under the basket. The trough container is a strong metal structure that provides definite support for various contents. Its dimensions are 19.5x7x6 inches and it weighs 2.4 pounds, being suitable for any type of flat surfaces. Taking into account the dimensions, this trough is very useful for feeding medium-sized animals like goats or sheep. And because it is slightly smaller compared to other feeders, it can be placed easily in stalls, small pens and outdoors too. This item prevents feed contamination by feces, having a design that doesn’t allow the content to have contact with the ground and it is also very easy to clean. The metal structure prevents the entire feeder from damage caused by the goats or other external factors and this thing helps in preserving it for a longer time. There is enough feed space for the animals, therefore shy feeding is avoided. This trough’s design is very suitable for shows or selling, having only 2.4 pounds which makes it easier to transport anywhere. It prevents wastage and goats/sheep defecating and trampling on feed which ensures a healthier environment. One of the main advantages of this trough is that it can hold any type of feed like grain, hay, pellets or chaffhaye. Due to its size, it fits anywhere and it helps you save a lot of space. It has a large capacity and it can fit in enough food for 2 goats and that is particularly helpful when there is a lack of space in your stall. There are no drainage holes and therefore if it is placed outside on rainy days, the water will stagnate in there and the food can get bad. Even though it fits outdoors too, being a metal-made structure it is more vulnerable to weather aging. The V trough feeder is a very practical feeding method for your goats, with an innovative design that prevents standing water due to the two drain holes on each end. It is made from steel, with a premium powder coat paint finishing. Its measures are 96 x 32 x 14 inches and it weighs 63 pounds, having suitable dimensions for small animals like goats. This item is what you need for your animals’ health and comfort, being large enough to feed up to 6 goats at the same time. This trough is 14 inches off the ground and it has a bar above so the goats won’t jump in or over it. Its V-shaped legs also help in this way by giving the feeder more stability. The feeder comes in three pieces which are very easy to put together, resulting in a fine strong structure. This trough can hold a large variety of feedings like hay, grain, chaffhaye, and weeds. This feeder is made from steel which means longer durability and also resistance to kicks or chewing. The two drain holes prevent the water from stagnating in the trough by automatically draining it out so the food won’t get soaked and become inedible. It has a large capacity, enough for 4-6 goats and it is a very good way to avoid food waste. The bar above the feeder doesn’t allow goats to jump over it and spill the content out of the trough. There might be a problem for some males that have big horns and therefore they may need to turn their heads a bit to reach the food but for the females, it shouldn’t be a problem at all. The V trough is more suitable for the adults and less for the kids, being a little bit too tall for their size. If you are looking for a feeder for sheep, goats or other small animals, the 4-feet V trough feeder is an excellent choice. Due to its dimensions which are 48 x 32 x 14 inches, this trough is suitable for adults. It weighs 39.2 pounds and it is easy to assemble. Thanks to the top bar, the trough can’t be turned over or pushed around by the goats, and it also keeps the animals out of the feeder. Its V-shaped bottom prevents the goats from jumping and standing in the trough. The structure is heavy-duty due to the steel that makes it and the powder coat finish which prevents corrosion from appearing on the feeder. It has a pretty large capacity and it can hold any type of feeding – grain, hay, weeds, chaffhaye. There are two drain holes that prevent standing water and spoilage so you will not be needing to throw the food away. This trough is strong and durable due to the steel framework that makes it less vulnerable to the possible damage caused by the goats. The graphite gray premium powder coat finishing prevents the feeder from corrosion or any other weather-related issues. The two drain holes are a great plus in order to avoid food waste by not letting it become soaked and inedible. The V form and the top bar prevent the animals from getting in the trough, avoiding food trampling. There are no difficulties in assembling it and it is easy to move it according to your needs. The trough can hold any type of food and it can feed 2 to 3 goats at once. The height of this trough may not be suitable for kids as much as it is for adults. It comes with multiple labels that are difficult to remove. This feed net is ideal for holding hay, preventing food waste due to its small 2-inch mesh holes. This item is different from other types of feeders being designed to give animals a more natural way of feeding by slowing the eating process. The dimensions are 9.8 x 6.3 x 2.7 inches and it works for a larger variety of animals like goats, sheep, horses, donkeys or alpacas. It only weighs 0.75 pounds and it has a large capacity, holding up to six flakes of hay. The height is adjustable and it can be hanged easily in stalls, barns, fences, trees or any other place, without taking up too much space. To avoid it being torn by teeth, the manufacturers made a sturdy net. The animals can pull the hay with ease and the feeder keeps the hay off the ground where it would be stepped on or soiled. Their ration lasts longer and it promotes better digestion. Slow feeding offered by this hay net allows your goats to have better digestion and prevents boredom, giving them a longer peaceful activity. It is a good way to save money by cutting down the hay waste. This feeder works well for different animal sizes, being suitable for goats and for horses too. The net is pretty sturdy and very easy to fill. The food lasts a longer period of time, being ideal for those cases in which you don’t have the time to give your animals hay more often. This item is very versatile because it offers you many possibilities of placing it wherever needed. It cannot hold other types of goat feeding like grain or chaffhaye. There might be a possibility that, with some effort, your goat will create a hole in the net and that’s why it is recommended to check it every day. The rugged ranch feeder has a heavy-duty construction made of galvanized steel, ideal for all livestock. It is 24.5 inches in width and 26 inches in length and it has two components – a top compartment which is ideal for hay and a catch base that can hold grain or chaffhaye. It is a freestanding feeder which weighs 67 pounds and it’s easy to attach it to pipe corral, wood or stall walls as it comes with two U brackets. The rounded edges assure your animals’ safety. There is enough space for 1-2 goats, having the right size for adults and kids too. It has a large capacity that allows your goats to eat for a couple of hours. The design allows feeding of forage and grain in the same feeder, helping you save on food costs. Due to its bottom, the food is kept off the ground and your goats are protected from ingesting parasites. The feeder’s design allows food to be mixed due to its base and the wire grid, the hay, and grain being effectively fed at the same time. Loose hay falls onto the bottom plate, not on the ground, which lowers the risk of your goats getting ill because of microorganisms. The entire structure is strong and durable due to the galvanized steel which makes it. It comes with two U brackets for an easy attachment to stall walls or fences. The round edges keep your animals safe, avoiding any possible injury. Having a rectangular form, the feeder is very stable and hard to be pushed by goats. This feeder doesn’t come with drain holes so it is more suitable for covered areas that are away from rain or snow. It doesn’t have a lid to cover its content if the situation demands it. This feeder is a tough metal box which holds both hay and grain at the same time. Having this item in your household offers you a better way to control feed and not be tied down to a daily chore. This combination feeder is ideal for 1-2 adult goats but it is also great for lambing or kidding season. It measures 30 x 16 x 22 inches, having the ideal height for goats, sheep, and other small-sized animals. With a weight of 18 pounds, it is easy to be hung on a bar or a board. The silver powder coat finish assures longer durability, making it less vulnerable to rust and corrosion. The top panel is a solid structure that reduces hay loss. There is also a bottom tray that allows your goats to have their hay mixed with some grain or chaffhaye. The tray is removable which makes the cleaning process easier. This hay and grain feeder allows mixing foods for a better meal for your goats. The grid’s square holes have the right size for the goats to easily pull the hay through them. Durability and stability are two main features of this item, being made of steel with a silver powder coat finish. Food waste is reduced due to the grid holes which are small enough to keep the hay off the ground. Cleaning the feeder and changing its content is much easier due to its removable bottom tray. The feeder is very portable and it can be placed on bars in your stall. There is a possibility that when the goats get under the feeder, they will lift it off the bar and make it fall. When it comes to bad-tempered goats, the bolts that hold the grate may need to be screwed back in from time to time. This rack is a heavy-duty structure consisting of half-inch round steel rods, ideal for holding hay. It is made in the U.S.A. and it works great for almost any type of herbivorous animals like goats, sheep, horses, and alpacas. The hay rack features two hooks that allow it to be mounted on a wall. For your animals’ safety, it has rounded edges so the risk of any injuries is lowered. Its dimensions are 33 x 27 x 12 inches and it has a large size, holding about half a bale of hay. Weighing 13 pounds, this item is long-lasting due to the powder coated finish and its steel rods. The finishing offers better protection against rust or any other type of time aging. This feeder allows you to easily check if your goats have enough hay. Additionally, it keeps the hay in place so it is not mixed with feces. 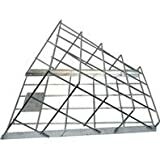 The hay rack has a very well constructed structure, being resistant to degradation in time due to the steel and the powder coat finish. It has no sharp edges where metal may stick out and cause injuries to your goats. Thanks to this feeder, there is less hay wastage which translates to better feed efficiency. Due to its hooks, it can be easily mounted on your stall walls at a proper height for your animals. The large opening of the rack allows you to easily fill it. Eating from this hay rack, the inhaling of dust or ingestion of parasites is reduced so your goats suffer fewer respiratory or gastrointestinal diseases. The hay rack does not come with any hardware in order to help you with mounting it, but using some screws will work. Some hay may fall from the rack and it is recommended to place a tray under the rack to catch any wasted hay. Priefert’s feeder is ideal for feeding both hay and grain, being a sturdy structure suitable for one horse or 1-2 smaller animals like goats and sheep. This feeder is designed to hold hay in the top welded metal rack and the grain in the bottom tub. The inside of the feeder is constructed from 16 gauge galvanized steel while the sides are constructed from 18 gauge galvanized sheet metal. It is a strong construction made to withstand any physical abuse caused by goats. It can be easily hanged on panels or lumber rails at the wanted height due to the bolt-on brackets. Measuring 29 inches in height, 21 inches in width and 19 inches in depth, this feeder is great to use in stalls or paddocks pastures. Weighing 49 pounds, it has an architectural grade powder coat finish with UV inhibitors that adds years of durability by helping the product resist rust, scratches, and fading. The hay and grain feeder offers a practical solution in order to carefully control forage intake. This item allows feeding grain and hay in the same feeder due to its two components. Hay wastage is minimized with this feeder by not letting it fall on the ground due to its bottom tub. It is designed to withstand physical abuse, being constructed from 16 and 18 gauge galvanized steel. Mounting brackets allow you to hang the feeder on panels or lumber at the convenient height for your animals. The powder coat finish prevents the feeder from deteriorations such as rust, corrosion, and scratches. It can be used in stalls, barns, pens, but it is also suitable for paddocks and pastures. This item doesn’t have a lid to protect its content from any weather-related occurrences. It can only accommodate one goat or two small goats. This strong hay net feeder prolongs the time it takes your goats to consume hay due to its 2-inch holes. It has a large ring at the base that maintains its form and a solid hanging rope which gives the net durability and resistance. Hay waste is considerably reduced, resulting in less mud and smelly decaying hay around the feeder. The bag is safe to handle by humans and animals too because the risk of injuries is almost non-existent. It is portable and adjusting the height according to your preferences is an easy process. This net has a large capacity that allows your animals to eat for hours which makes it ideal during the night or winter when you have to keep your goats inside. The slow feeder is also good for their health, giving them optimal digestion and fermentation which require time. This hay net is suitable for a large variety of animals like horses, goats, sheep, and alpacas. The large ring at the base prevents the net from unraveling. It slows down the digestion and that is good for your goats’ health and it is also more efficient because less hay is consumed this way. Eating from the hay net feeder prevents respiratory and digestive diseases by not letting your animals eat off the ground. The goats are kept busy for a longer period of time which cuts the number of times you have to rebuild the stock. A slow feeder helps with controlling the weight of your goats. It is possible that goats could get a leg stuck in the holes of the net so it is recommended to check on your animals periodically. Being a light item, it can be pulled off the wall by the goats. This combination feeder allows mixed feeding with both hay and grain at the same time. It can be placed in different locations as it hangs on fences, mounts on stall walls and it is also very useful in corrals or trailers. Suitable for any type of herbivores, the feeder holds about one flake of hay and 5 gallons of grain. The unnecessary mess is avoided due to this feeder that keeps the hay and grain off the ground. The heavy-duty feeder made in the U.S.A. reduces hay waste due to the top sturdy hot-rolled steel bars and the catch bottom tray. Made of 16 gauge steel, the entire structure ensures long-lasting strength to guarantee the safety and comfort of your goats. Easy to install, the product comes with mounting hardware and instructions. It measures 30 inches in height, 24 inches in weight and 12 inches in depth. The grain and hay feeder offers versatile feeding for a large variety of animals. It is very easy to install as it comes with mounting hardware and instructions for a better understanding. Your goats’ safety is assured due to the convenient spaces between bars that don’t allow the animals to get their heads stuck. It can be easily attached to stall walls, corral fencing, or trailer walls. The removable hangers hold up to heavy use by energic goats or horses. The bottom tray doesn’t allow the food to reach the ground which means less food waste and also healthier goats. This item doesn’t have drain holes to prevent the food from getting soaked in case of rain so the feeder has a better use indoors. The feeder isn’t recommended for more than 2 goats at the same time, being more of a single-animal feeder. There are various types of feeders, some only being able to hold hay, while others capable of keeping lots of different food for your animals. They each come with advantages and disadvantages. Nevertheless, after you buy a feeder or you make your own homemade goat feeder, make sure to also get a goat mineral feeder, for those added nutrients. Here are some details about the types of feeders you can find for sale. These are usually the best models if you are looking to have one of them installed for each goat. That is because one animal can easily eat from such a feeder, but it’s difficult for more to do that, due to the reduced size. But if you have a single goat, it is ideal. An advantage that these goat feeders have is that they don’t spill any food. Because of how they work, the food that is on the top rack will drop on the bottom plate, and not on the floor. This way, the risk of eating off the floor is eliminated, and the goats can eat the whole food. You can use such a feeder to give two different types of food to your goats – the top part is made to hold hay, and any small pieces of hay will fall on the bottom part. You won’t need two separate hay and goat grain feeders. What is bad about this design, however, is that it usually doesn’t come with drain holes and the food will get damped and water will sit in the bottom part. These double feeders are also very portable, which comes as an advantage and a disadvantage at the same time. The good thing is that they can be placed nearly anywhere, requiring little effort to be moved around. They can be hung or they can sit by themselves. But because they are light, the goats can tip them over and they can get injured. If you’re looking for some cheap goat feeders, hay nets are usually what you need. They represent a versatile alternative to troughs. People usually get these nets because they are good at making the goats eat slower. And that is a good thing, as it helps to improve the animals’ digestion. Hay nets are also great for the cold seasons when the animals spend more time inside. Herbivores like to graze and eat a lot, and in the winter they, unfortunately, cannot do that. So a net full of hay will offer them the chance to chew for several hours, especially when eating is slowed by the design of the net. This is the same reason why the nets are good for the night. Goats spend many hours being awake in the night, and during that time, when they are inside, they don’t have much to do. So they go to the hay net and start chewing. That is why a hay net is a good alternative to an automatic goat feeder. Occupying so little space, the nets can be hung anywhere, be it inside or outside. You will save a lot of space using these nets, although you will need more of them if you have more goats. Wherever you hang the nets, make sure the goats can’t pull them down and injure themselves in the process. Besides that, there is no real reason for concern as the nets are very safe and durable. The goats will thus have no chance of breaking them and eating their fabric. The only small issue is that naughty animals can jump around and stick their legs in the net, and if you’re not around to pull them out, they may stay like that for a long time. Designed to hold more food, the troughs can be used if you want to feed more goats, and each of them can be used by 4 to 6 goats at the same time. Good goat feeders that are bigger can accommodate even more than that. So if you’re short on space, you just get one trough and feed the entire family of goats. A trough isn’t as big as a round bale feeder for goats, but it does a similar job. Most of them come with drain holes, meaning that they won’t let water sit in them for too long. That is essential in maintaining the food fresh for the goats. This is the reason why the troughs can be used outside too. And to help with that, they are also very sturdy and resistant to weather. However not every trough comes with drain holes, so pay attention to that. Because goats have the pleasure of jumping on and over objects, some troughs have a bar above them that won’t let the animals jump on them and trample the food. That is good for the animals’ safety, and also for their health, as they won’t contaminate the food with bacteria that they have on their hooves. Also, those that are V-shaped don’t let the goats stand on them, due to their shape. The main advantage of a food trough is that you can place any kind of food in it, be it hay, grain, chaffhaye, weeds or forage.